^ Gould, Stephen Jay (1991). "The Case of the Creeping Fox Terrier Clone" Bully for Brontosaurus: Reflections in Natural History (pp. 155-167). New York: W.W. Norton & Co.
^ Gould, Stephen Jay, op. cit., "Bully for Brontosaurus"
^ a b Fossil Horses In Cyberspace. Florida Museum of Natural History and the National Science Foundation. ^ Hunt, Kathleen (1995). Horse Evolution. TalkOrigins Archive. ^ MacFadden, B. J. (1976). "Cladistic analysis of primitive equids with notes on other perissodactyls." Syst. Zool. 25(1):1-14. ^ Prothero, D.R. and Shubin, N. (1989). "The evolution of Oligocene horses." The Evolution of Perissodactyls (pp. 142-175). New York: Clarendon Press. ^ MacFadden, B.J. (2001). “Three-toed browsing horse Anchitherium clarencei from the early Miocene (Hemingfordian) Thomas Farm, Florida”. Bulletin of the Florida Museum of Natural History 43 (3): 79-109. ^ Salesa, M.J., Sanchez, I.M., and Morales, J. (2004). “Presence of the Asian horse Sinohippus in the Miocene of Europe”. Acta Palaeontologica Polonica 49 (2): 189-196. ^ MacFadden, B.J. (1984). “Systematics and phylogeny of Hipparion, Neohipparion, Nannippus, and Cormohipparion (Mammalia, Equidae) from the Miocene and Pliocene of the New World”. Bulletin of the American Museum of Natural History 179 (1): 1-195. http://hdl.handle.net/2246/997. ^ MacFadden, B. J. (1984). "Astrohippus and Dinohippus". J. Vert. Paleon. 4(2):273-283. ^ a b c d e f Weinstock, J.; et al. (2005). “Evolution, systematics, and phylogeography of Pleistocene horses in the New World: a molecular perspective”. PLoS Biology 3 (8): e241. doi:10.1371/journal.pbio.0030241. http://biology.plosjournals.org/perlserv/?request=get-document&doi=10.1371%2Fjournal.pbio.0030241&ct=1 2008年12月19日閲覧。. ^ a b Orlando, L.; et al. (2008). “Ancient DNA Clarifies the Evolutionary History of American Late Pleistocene Equids”. Journal of Molecular Evolution 66: 533-538. doi:10.1007/s00239-008-9100-x. ^ a b c Vila, C.; et al. (2001). “Widespread Origins of Domestic Horse Lineages” (PDF). Science 291. http://www.uky.edu/Ag/Horsemap/Maps/VILA.PDF 2008年12月19日閲覧。. ^ a b Jansen, T.; et al. (July 2002). 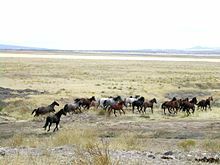 “Mitochondrial DNA and the origins of the domestic horse”. Proceedings of the National Academy of Sciences 99 (16): 10905-10910. doi:10.1073/pnas.152330099. http://www.pnas.org/content/99/16/10905.full 2008年12月19日閲覧。. ^ Singer, Ben (May 2005). A brief history of the horse in America. Canadian Geographic Magazine. http://www.canadiangeographic.ca/Magazine/ma05/indepth/#cnd 2009年10月16日閲覧。. ^ "Ice Age Horses May Have Been Killed Off by Humans" National Geographic News, May 1, 2006. ^ Buck, Caitlin E.; Bard, Edouard (2007). “A calendar chronology for Pleistocene mammoth and horse extinction in North America based on Bayesian radiocarbon calibration”. Quaternary Science Reviews 26 (17-18): 2031. doi:10.1016/j.quascirev.2007.06.013.